Emmanuel Macron had planned to speak to the French people last night, but not like this. Barely an hour before he was to lay out his response to the concerns behind 22 weeks of Yellow Vests demonstrations, flames shot up from Notre Dame Cathedral. The president raced to the scene of the disaster after delaying his speech and vowed live on television to rebuild the 850-year-old landmark with public donations. It’s his chance to unite a bitterly divided country. 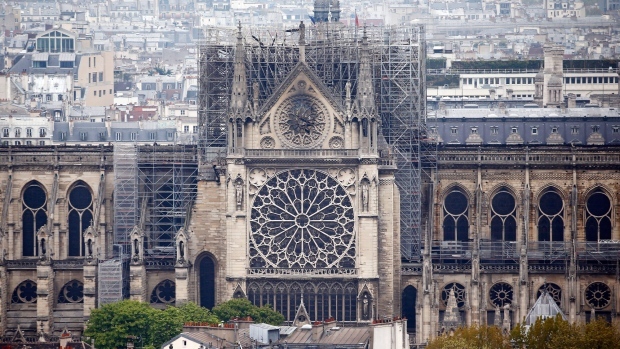 But will French citizens beset by high taxes and high unemployment equate rebuilding a cathedral with supporting Macron’s agenda? Less than a third of French people say he’s doing a good job. His program has been hamstrung by protests by the Yellow Vests — a grass-roots movement protesting inequality, with occasional racist and violent overtones — and every side of the opposition. He has few political allies, and his monarchical leadership style offends even his supporters. The hope is that the Notre Dame disaster will help him rebuild support. Already, France’s two leading luxury billionaires have pledged 300 million euros for the effort. Nuclear Strategy | North Korean leader Kim Jong Un picked up the pieces from his failed nuclear summit with Donald Trump and told his rubber-stamp parliament he’s ready for another session, albeit on his terms, giving the U.S. president a year-end deadline to ease sanctions. Youkyung Lee reports on Kim’s speech to the Supreme People's Assembly, the new lineup of cadres in his inner circle and what it means for nuclear diplomacy. War chest edge | Fundraising totals for 2020 candidates show the advantage of being an incumbent president — and the challenge for Democrats, who are raising less money and still have to compete among themselves before taking on Trump. The Trump campaign and joint committees ended the first quarter with $48.9 million in the bank, more than three times as much as any of the potential challengers in a crowded Democratic field. Speed voting | Indonesia moves fast for a young democracy. It will deploy about 7.2 million poll workers to help 191 million citizens vote for a new president and several thousand lawmakers — in just six hours. The world’s largest single-day democratic election will see President Joko Widodo — who’s leading in official polls — pitted against former general Prabowo Subianto, who’ve both sought to focus on bread-and-butter issues like the price of staples, jobs and the economy. Democratic demands | Congressional Democrats issued subpoenas to Deutsche Bank and other financial institutions to obtain long-sought documents indicating whether foreign nations tried to influence U.S. politics. The move signals an escalation of their probes into Trump’s finances and any dealings with Russians, with Attorney General William Barr now expected to send Special Counsel Robert Mueller’s report to Congress and make it public on Thursday. Xi loyalty app | China's state-run CCTV is hiring hundreds of people to ramp up a mobile app used to test Communist Party members’ loyalty to President Xi Jinping and the party. Dubbed “Study the Powerful Country,” the app has become a major topic of conversation among bureaucrats and party officials who are required to download it — with some spending hours racking up points. Trump has announced plans to send some migrants caught crossing the southern border into the U.S. to so-called sanctuary cities — local governments that enact policies protecting undocumented immigrants — touching off criticism from House Democrats. Billionaire Foxconn founder Terry Gou said he’s considering a run for Taiwan’s presidency, adding to the field of potential challengers against the island’s leader. And finally ... India’s marathon election is being fought in the skies with private jets and helicopters. Problem is, there’s not enough to go around. Prime Minister Narendra Modi’s cash-rich BJP booked most of the nation’s available private air fleet, leaving few options for the main opposition Congress party, Anurag Kotoky and Shruti Srivastava report. Indian elections are famous for using almost any means to disrupt opponents’ campaigns. But this kind of rivalry hasn't extended to the sky before now. --With assistance from Jon Herskovitz, Kathleen Hunter and Daniel Ten Kate.